What do Kenya, Indonesia, and Ecuador have in common? If you said the equator runs through all of them, you are correct. On the equator in Ecuador, you can do some strange experiments that you can’t do in many other places and get the same results. I’ll tell you about them in a minute. The equator is the imaginary line at 0 degrees latitude that circles the earth. It is what delineates the northern hemisphere from the southern hemisphere. 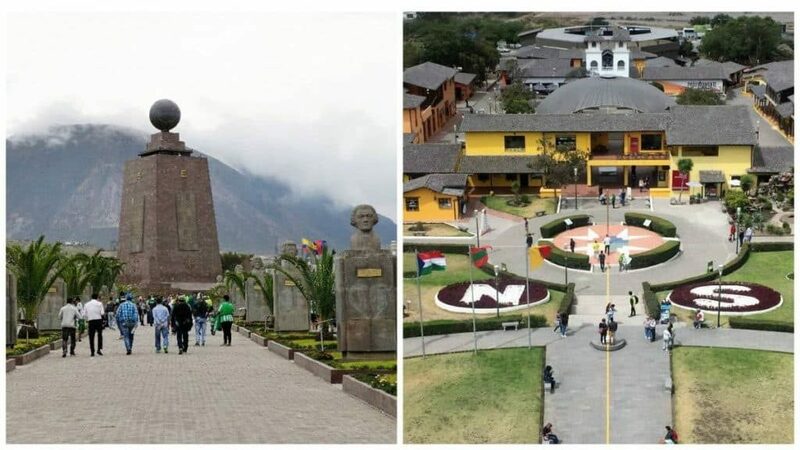 Other countries have the equator running through them, but Ecuador is a little unique in that it has the highest elevation on the equator, 4,690 meters or 15,387 ft. A French geodesic expedition team led by an explorer named Charles-Marie de La Condamine in 1736 came to Ecuador because of the altitude and clearest view of the stars to map the equator. A large monument called Mitad del Mundo meaning Middle of the World dedicates this discovery. Considered to be on the equator until the discovery by use of GPS proved that the equator is approximately 250 yards away. At the Ciudad Mitad del Mundo there is a large painted yellow line separating the northern and southern hemispheres which make for some great pictures having a foot in each. You are free to roam the grounds and the museums and even have your passport stamped, “middle of the world”. Other attractions include a planetarium, a miniature model of Quito, and restaurants. In one section of Ciudad Mitad, there is a small colonial-like town with stores that sell local handicrafts and food. After the Mitad del Mundo, we thought we should visit the actual equator, so we went to the Inti Nan Museum. Located just around the corner is the museum. As we entered Inti Nan Museum, which means the path of the sun, their proud sign assured us that we are now at zero degrees latitude neither north nor south of the middle of the world, as calculated by GPS. At this attraction, you go on guided tours with a guide who speaks your language. 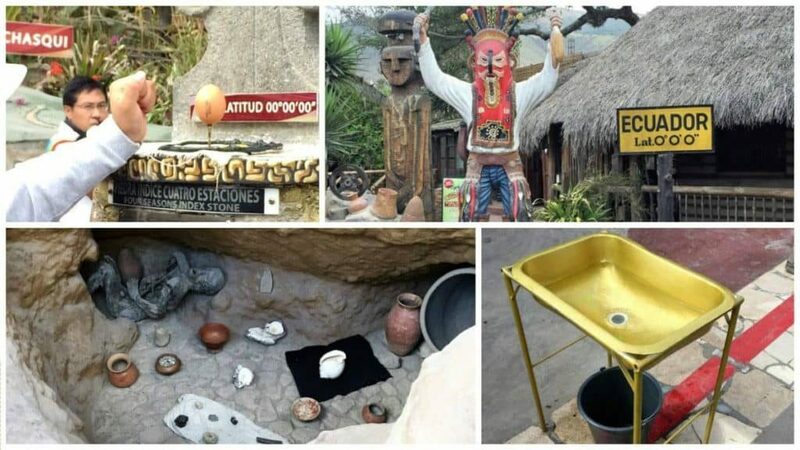 The tour takes you along a path where you learn some history of Ecuador and its indigenous people such as how the Amazonians shrunk human heads, the building of totem poles and an exhibit featuring people of the Amazon and how they lived and buried their dead. Next, you come to the equator. Here the equatorial line is painted red. The tour becomes interactive at this point with demonstrations whose results can only achieve at the equator. We saw a sundial in action and learned how the early inhabitants of the area used it to tell time and where during the equinoxes, you will see no shadow. We tried to walk along the equator with our eyes closed. No one in our group could keep their balance doing this. Our guide balanced an egg on the head of a nail, something that is only possible on the equator. One person in our group succeeded at this task leaving the rest of us feeling defeated. The last part of the tour answers the age-old question of will water spiral down a drain in different directions in the northern hemisphere versus the southern hemisphere? A wash basin is used to demonstrate what is termed the Coriolis effect. They placed the wash basin about ten feet from the equator, and the water flowed counter-clockwise. Then they moved it to the other side, and it swirled clockwise. Lastly, they put it right on the equator, and the water didn’t swirl at all. You can see this demonstrated in the video at the end of this post. They would toss in a couple of leaves to help you see the swirling action. A Visit to the Equator is a Must! The Mitad del Mundo is iconic and grand. But experiencing the “at the equator” only experiments dictates going to the Inti Nan Museum. 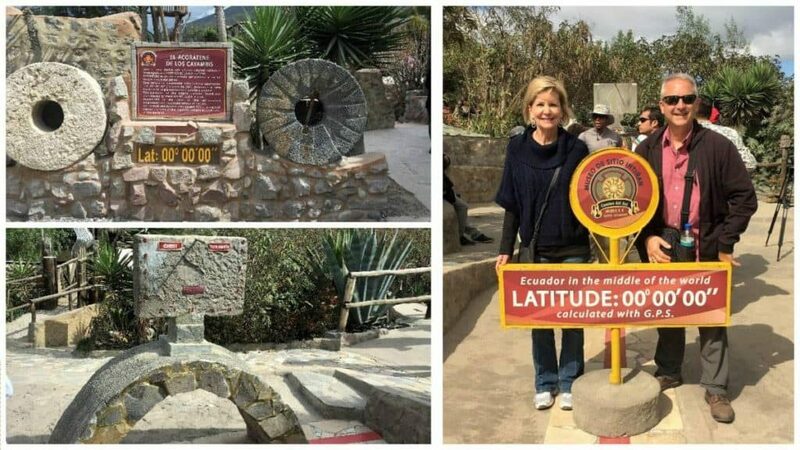 If you are traveling to Quito, you have to check off from your bucket list a trip to the equator in Ecuador. And to experience it fully, you need to visit both places. Have you visited either site? If so, I’d like to hear about your experience in the comments below. As far back as I can remember I was adventurous and wanted to see the world. The first time I traveled outside the country was with Keith just after high school graduation. After that, I was hooked. Throughout my career I was just like many of you, I wanted to work less and travel more. Keith and I made early retirement a reality. Now, I am here to help you retire early and find the inspiration to venture out and see the world.